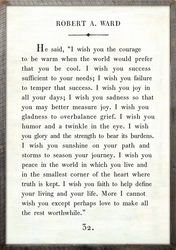 He said, "I wish you the courage to be warm when the world would prefer that you be cool. I wish you success sufficient to your needs; I wish you failure to temper that success. 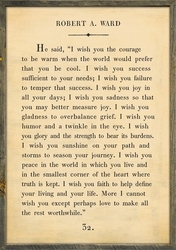 I wish you joy in all your days; I wish you sadness so that you may better measure joy. I wish you gladness to overbalance grief. I wish you humor and a twinkle in the eye. I wish you glory and the strength to bear its burdens. I wish you sunshine on your path and storms to season your journey. 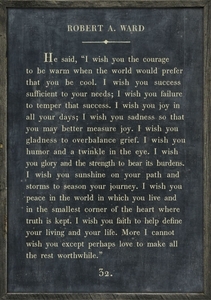 I wish you peace in the world in which you live and in the smallest corner of the heart where truth is kept. I wish you faith to help define your living and your life. More I cannot wish you except perhaps love to make all the rest worthwhile."